Life is becoming busier and busier, and there is barely enough time for the small stuff. Well, there is nothing wrong with that as it helps us exploit our potential to the fullest. And of course, enjoy the best things in life – we have to find some purpose and enjoy it while it lasts. Towards that ultimate goal, technology has an important role to play, and it does play. But despite the associated benefits, the use of these devices is taking a toll on our health through the posture we adopt as we use them. Using the computer for long periods causes strain and pain on the neck and back. 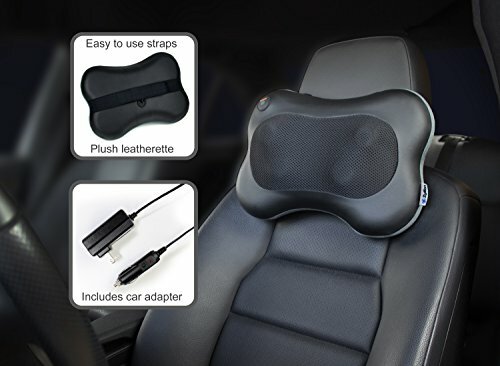 However, an efficient massager like the zyllion shiatsu massage pillow is what you need. It has all the right features to get to the root of the problem, so you can get back to being at your best. There are various types of massages including the Swedish massage, hot stone massage, and chair massage among others. The physical massage, where you go to the spa, and a professional masseuse uses their hands to work on your body is the ideal. However, it is not everybody that has the time, and of course the money to do it on a regular basis. Massagers like zyllion shiatsu massage pillow is a convenient and a cheaper way of getting the necessary massage. The massager is compact, lightweight, making it easy to carry around. But who needs a massager, and what are the benefits? Well, shiatsu massage is a form of eastern medicine, and it involves the use of fingers, elbows, knees, thumbs, and hands to apply pressure on the target areas. And unlike contemporary medicine, shiatsu massage has an entirely different perspective regarding healing. Eastern medicine focuses on bringing balance to the body for the healing to happen. The basic theory underpinning the massage technique is that our bodies are products of qi, a form of energy. Illnesses occur when a blockage of the qi happens. Shiatsu removes this blockage, and allows free flow, bringing balance to the body. Balancing the vital energy brings about healing to the body. Zyllion shiatsu massage pillow is therefore appropriate in unblocking the qi, sufficiently. But which conditions does the compact device help with? Many people spend a significant number of hours trying to make ends meet. As a result, they pack up fatigue as the time goes on, and this can result in unproductivity, and of course, diseases. The massager helps restore the qi, and maintain it. A session with the device minimizes any restless and anxiety. You can then have a good night sleep, thereafter. Massage triggers the rest reflexes, enhances fluid exchange, and corrects any possible muscle imbalances to improve the range of motion, and flexibility. If you are suffering from stress and anxiety, then the massager can help a great deal. A few sessions of the massage improves circulation, carrying with it the stress hormones away from the body. A good massage session helps with the mood so that you can remain motivated to complete your goals. Stress and tension tend to hurt our motivation. The zyllion massager is an effective pain reliever through enhanced blood flow. You see, the device unblocks the qi, allowing efficient flow of the blood, and the necessary nutrients to the problematic areas. The massage relieves headaches and joint pains among others. In a study done on 401 individuals with severe lower back pain, a frequent massage was shown to have a positive effect. It reduced the pain, and its effects lasted for more than six months. Improved circulation from using a shiatsu massager enhances the healing process for those with sprains, and other forms of injuries. Massage also helps with postsurgical rehabilitation. That means it can hasten the healing process so that you can be back to your usual self again. The increased blood flow takes the necessary nutrient and energy, thereby supporting the healing process. Research indicates that a regular massage leads to relaxation, and eventually, your regular sleep pattern. That means days of turning and tossing are over, with the right massage therapy. A good massage therapy leads to the production of serotonin, a hormone that reduces pain and helps you relax. A study shows that massage has good payoffs for those living with arthritis. Specifically, they experience improved range of motion and a stronger grip. According to Touch Research Institute, a regular massage reduces pain for people with arthritis, and better overall joint function. Light circular massage motions in the stomach improve the digestive system enhancing circulation and preventing constipation. Bloating and gas are two factors that easily cause digestive problems. However, massage can alleviate any excess amount of gas and keep any possible issues at bay. Numerous muscles on the upper body have a role to play in the breathing system. That means when they are tight, they can quickly affect the breathing patterns. However, regular massage sessions on these muscles increase their flexibility, thereby improving their breathing. The improved posture as a result of the regular massages opens the chest area, increasing your breathing capacity. Among the numerous benefits associated with a better breathing capacity includes resilience during exercises, and improved stress and tension management. Before you can get inside for that crucial meeting, a moment with your massager can help get hold of your nerves, and be sufficiently confident to deal with any situation, ahead of you. In the following zyllion zma13bk review, we look at the features, as well as the pros, and cons. Design and Durability: the massager scores highly when it comes to design and durability. At only 4lbs and measuring 2.4 inches, Zyllion shiatsu massage pillow is the ideal for those people regularly on the move. That means you can take the device with you, wherever you go and still work on that sore shoulder or neck. The textured leatherette material enhances the durability of the massager. You may think that standard leather is preferable, but nothing could be further from the truth. It tends to warp, and in certain situations crack when it is in a heated environment. In contrast, leatherette is much more flexible than its counterpart and much more tolerant of heat. 3D Massage Nodes: these are the essential features of the best pillow massager. The nodes in this unit massage freely move forward and backwards, as well as, right and left in a way that mimics the human hands. It is quite an impressive feature that you will never see in most other massage products like massage chairs. Convenient Straps: a compact and lightweight device like this shiatsu massager may not stay in position for the typical However, it comes with comfortable straps that you can use to fasten it on the chair, and enjoy a shiatsu massage, as you sip on your ginger tea. The straps also make the massager versatile. You can strap it along the lumbar area or even the neck for increased efficiency. Heat: works magic on any sore muscles. Heat has a positive effect on blood circulation, thereby removing any tension, knots and pain. Safety: such devices sometimes come with specific risks like shocks and burning. There is always a certain amount of risk associated with mechanical components, and more so where there is heat. However, the massager features an overheat protection that shuts the device off after 20 minutes. It also features a UL-approved power adapter that is quite safe to use. There’s also a car adapter that together with the AC adapter, enhance the massager’s portability. You can connect the machine anywhere, and enjoy the session. Quiet Operation: the smooth operation is one feature that will surprise you. Well, it may not be too quiet, but it will not interrupt others in the same room. Favorable Warranty and Customer Service: a desirable warranty is the clearest indication of quality. It means that the manufacturers have faith in their product and are ready to take responsibility for any quality-related issues. The massager has an attractive 90-day money-back guarantee where you can return the unit if you feel that it does not meet your expectations. There are horror stories everywhere on the internet regarding unfavorable customer experience. Sometimes, it is hard to avoid defects regardless of the brand altogether. However, the massager’s customer service is what we can refer to as favorable, and it makes the whole experience, worth it. Is it okay to sit on the massage pillow? Pain can occur in the most uncommon of spots, and it is okay wonder if you can sit on the massage pillow. However, you should remember that it is an electrical device, with mechanical components that may break under a significant amount of pressure. Therefore, avoid sitting on the massager, or you may end up counting losses, and injuries. How do you clean the massage pillow? Remember that this is no ordinary pillow, and so the question of whether you can soak it or dry clean it does not apply here. Use a damp cloth to wipe down the device – it shouldn’t be difficult. Can I lie down on the massage pillow?It is quite okay to lie down on the massager pillow but before you can go right ahead and do it, make sure you are familiar with the intensity. You don’t want to end up with a sorer back and neck, as a result of the high intensity. If you are using it at your lower back, you may need to prop your shoulders with pillows for comfort. Can I use the massage pillow on my foot? Well, the massage pillow is quite versatile, and it allows you to use it on any body part. However, the massage pillow may not be quite effective on your foot. There are other useful devices you can choose from for your foot, as opposed to the massage pillow. Is the massage pillow more effective than a professional masseuse? No device can beat the efficiency of a masseuse’s hands and technique. However, it is cheaper and more convenient having a massage pillow, than visiting the spa now and then. But, it is not a bad idea to visit the spa once in a while. 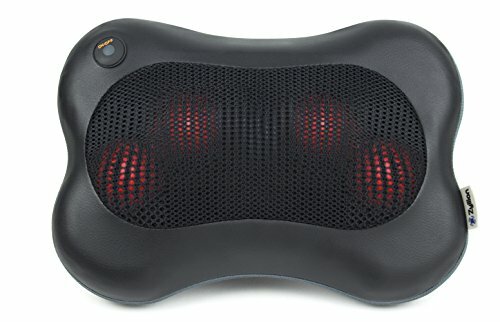 Does the massage pillow have vibration? Unfortunately, the device does not have any vibration, but you can enjoy other features that it has. 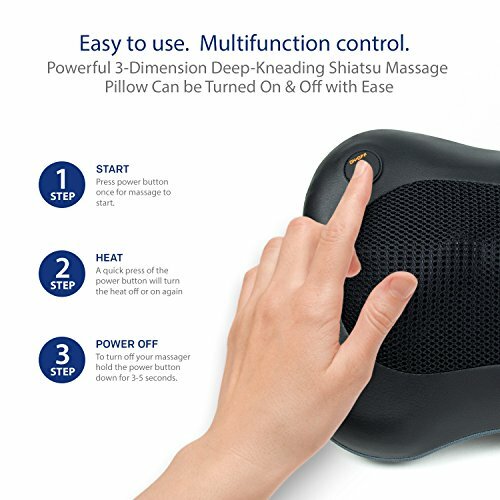 Zyllion shiatsu massage pillow is great massager with all the right features you need to end that shoulder pain or neck pain. The massage pillow is convenient and easy to use – the elements that make it a darling for many. What even makes it the best pillow around is the favorable warranty terms, customer service, and support. Therefore, you will enjoy not only the shopping experience but also the function of use – it is durable and functional.